Install a more secure silt fence faster and easier with the silt fence installer attachment. Meet erosion control regulations and avoid costly fines. The silt fence installer is the fastest, easiest, and most economical way to install silt fence. Simply load the fabric into the quick-threading installer, roll into the ground and drive – the silt fence unrolls itself. A quick change cap – mounted on the end of the silt fence installer – includes a spring-loaded plate which ensures proper tension on the fence roll, keeping the roll from accidentally unwinding while on the job. And the coulter wheel slices through the turf and roots of the working environment. Increase productivity by installing thousands of feet of silt fence per hour while avoiding fines and project shutdowns. Rigid Mounted Loader Frame: Positions the installer blade at the centerline and will attach to loaders only. Install silt fence on residential, commercial and industrial construction projects, and highway projects. The operator threads the silt fence under a rod and through the chute on the blade. The blade is positioned for optimum fence placement and the attachment is lowered into the ground. 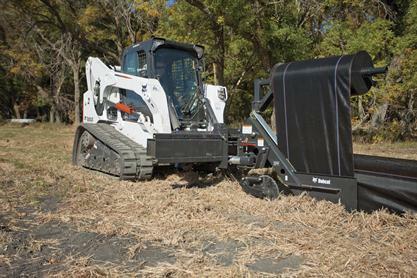 As the machine is driven, the silt fence unrolls automatically. When beginning to install a fence, the centering springs work to keep the blade straight, allowing for accurate placement. The fence is cut when finished. Blade Pivot: When installing a fence, the blade on the silt fence installer pivots relative to the frame for maximum turning ability. Centering Springs: Work to keep the blade straight when beginning the installation, allowing for accurate fence placement. Coulter Wheel: Slices turf, roots, and more to assist the blade in ground penetration, delivering maximum installer performance and productivity. Prop Stands: Provide easy, 3-point hitch mounting for quick attaching. Replaceable Tooth: Easily penetrates the ground, helping to pull the blade directly into the soil when placing the fence. Tooth is replaceable for easy and affordable maintenance. Quick-Threading Installer: Load the fabric into the quick-threading installer by pulling it down under the installer’s guide rod and pulling through the chute. Spring-Loaded End Cap: When working hard on job, the spring-loaded end cap acts as a brake to keep the fence roll from unintentionally unrolling. Side Shift Mounting Frame (optional): Offers the ability to manually position the blade in multiple positions across the frame width. Delivers optimum position placement of the fence for accurate installation.